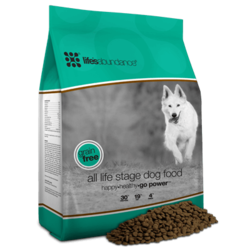 We feed our puppies Lifes Abundance grain free all stages food. Please be sure to follow the link below (click on the picture) and get your puppy food ordered at least 10 days prior to picking your puppy up. Why Lifes Abundance? It is quite simple....too many recalls on commercial dog foods. Sick dogs, sick kids...it is just not worth the risk. It is tough trying to find a quality food that I can stand behind as a breeder. Lifes Abundance has been that food for several years now. 3) Save a little by becoming a distributer. #2 is the best option in my opinion unless you are a retail supplier like a vet or boarding facility. You are ordering in bulk, getting the autoship discount (even if ordering every 6 mos) AND saving on shipping!